Update 06/02/2019: The Tesla Amazon storefront has been removed for some reason. If I had to guess I’d assume the store went up early by accident. This may also explain why it only sold some of its vehicle accessories instead of all of them. Clicking on the link to the store take you to Amazon’s ‘Page Not Found‘ screen. There is a picture of a dog on this screen and if you click it you’ll be taken to an Amazon blog post about the dogs that “work” there. MobileSyrup has reached out to Tesla for more information. A new Tesla store that is selling the company’s apparel and accessories has appeared on Amazon.com. Tesla isn’t just listing its products on the online retail giant’s platform. It’s taken things a step further by building its own Amazon Storefront. There are two types of cases — A folio and a regular case, with each one coming in three sizes. You can buy iPhone 8, iPhone 8 Plus and iPhone X cases on the store. The regular case is $35 USD (roughly $45 CAD) and the Folio is priced at $45 USD (roughly, $60 CAD). So far Tesla isn’t selling all of the products from its own accessory store through Amazon. Notable omissions are items like its Wall Charger and plastic floor mats. Since Tesla went to all the trouble of setting up an Amazon store, it seems likely that it will add more items to it in due time. 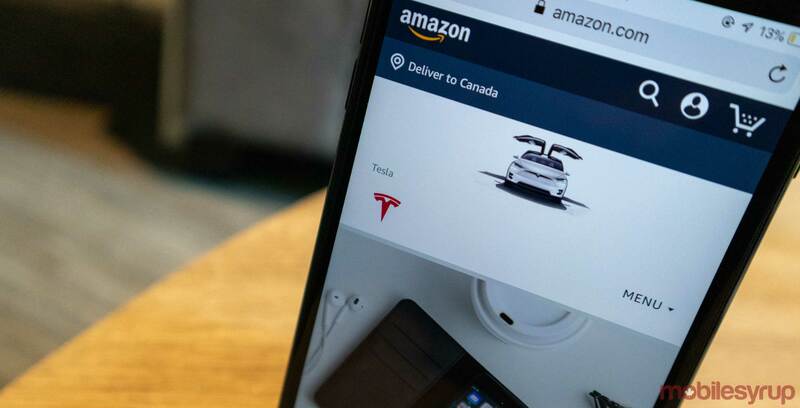 Unfortunately, the Tesla Amazon store isn’t available on Amazon.ca, but it looks like you can ship most of the products from the American version of the store to Canada.